Credit, Paypal, AliPay, Google Checkout™. You Choose! Now you can purchase your favorite R/C parts with a variety of payment methods. You've seen PayPal at eBay and scores of other leading online merchants -- and now ATees.com has it. You may enter your credit card details after being directed from our site to Paypal's website. In the shopping cart under "Express Checkout", click on the Paypal Checkout button. Verify that ATees.com is the merchant from whom you are purchasing. Log in to your Paypal account, or click on "Don't have a Paypal account?" button to enter your credit card details. Confirm your shipping address and payment details and click on "Pay Now" to complete transaction. A member of the Alibaba Group, Alipay enables individuals and businesses to securely, easily and quickly send and receive payments online. Alipay works like an escrow service, solving the issue of settlement risk in China. Confirm your order on the payment page and select Alipay as your payment method. You will proceed to the Alipay Web site and log in. Once your payment is processed, you will be returned to the Order Confirmation page to complete your order. Your order will be fulfilled when the Alipay payment has been successfully processed. Your credit card information is secured by Paypal and Google Checkout. 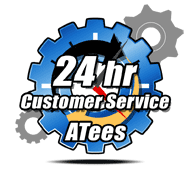 The majority of our customers use credit cards to pay for their ATees.com products. You may enter your credit card details after being directed from our site to Paypal or Google Checkout. You may also pay through the phone or swipe your card in person! Search, shop and checkout - all with Google. Want a faster, safer, and more convenient way to shop online? You got it. With Google Checkout™ you can quickly and easily buy from stores across the web and track all your orders and shipping in one place. Its fraud protection policy covers you against unauthorized purchases made through Google Checkout, and Google won't share your purchase history or full credit card number with other sellers. In the shopping cart under "Express Checkout", click on the Google Checkout button. Verify that AsiaTees Hobbies is the merchant from whom you are purchasing. Log in to your Google account, or simply enter your credit card details. Confirm your shipping address and payment details and click on "Place your order now" to complete transaction. Internet purchasing has been reserved for folks who use credit cards. Not at ATees.com. We understand plenty of people don't use credit cards. If you're one of them, you're welcome here, and can pay via checking account debit. Simply click on the Paypal Checkout button and sign up for a Paypal account using your bank account details. NOTE: If you're paying by check, the payment will take approximately 2-3 days to clear. Your order is processed for shipment once payment clears. If you need to send a payment to us, for example, to add more items to your existing order, you may do so here by entering the total amount and the description of your payment. After clicking the Proceed To Confirm button you will be asked to confirm the details of the payment.